The Long Way Home. Huntsville to Cleveland on a 250. 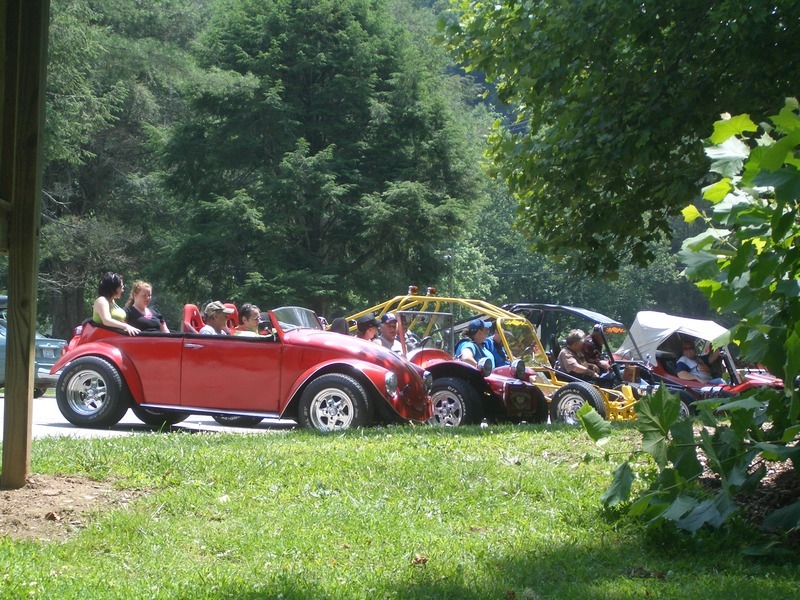 Discussion in 'Ride Reports - Day Trippin'' started by klaviator, Jun 26, 2012. Huntsville, Al to Cleveland, Oh. Take a look at a road atlas. 660 miles of interstate highway and you're there. Doesn't sound like much of an adventure does it? No one says you have to take the direct route. It's been quite a few years since I took a long trip on a bike. 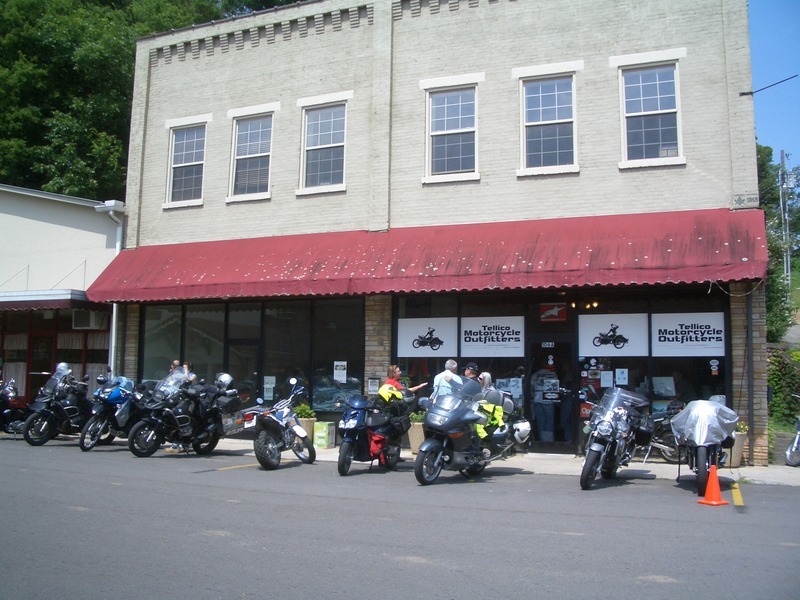 I have spent most of my limited vacation time riding but since I live pretty close to some of the best riding east of the Rockies, I have been just heading to the Smokies and getting a room in towns like Maggie Valley and just doing day rides from one location. While these have been fun, I miss getting on a bike and just going somewhere far away. I have also wanted to try doing a long trip on a small bike. Also, mostly because of this forum, I have wanted to try camping along the way. Except for one overnighter last fall, all of my camping experience has been with taking my gear and bike in my truck. Then a couple of months ago my Mom called and said they were throwing a big party for their 50th wedding anniversary and wondered if I could make it. I had already scheduled vacation but was able to change it to the week leading up to the party. Now it was time to plan the trip. My wife already made plans for that week so this would be a solo trip and she would fly up to Cleveland. I asked for route suggestions on a couple of regional forums and bought a new lightweight sleeping bag and a few other minor items. Although I did come up with a rough plan, I figured I would mostly end up winging it and making up a route as I went along. My plan was to use 5-6 days getting to Cleveland and head up through the mountains of TN, NC, VA, and WVA while taking mostly back roads. Then after a few days in Cleveland, I would have to make the return trip in a day and a half. I could have hit the road Friday around noon after getting off work but decided to relax and get up early on Saturday morning. I didn't set my alarm and ended up on the road by 4:30 AM. It had been a tough decision between wearing a mesh jacket or well vented textile jacket. I decided on the Mesh but soon regretted it as I quickly got cold. I could have stopped and put on my rain jacket but I hate doing that so I stayed cold. Eventually I did put it on as it took a long time to warm up. My route was I565 through Huntsville to 72 East. As I approached I24 I decided to try to avoid the interstate as much as possible. I had seen this bridge before and decided that this would be the time to cross it and see where it went. 156 east turned out to be a very nice ride with some nice curves and scenery. It ran along a lake for a while. 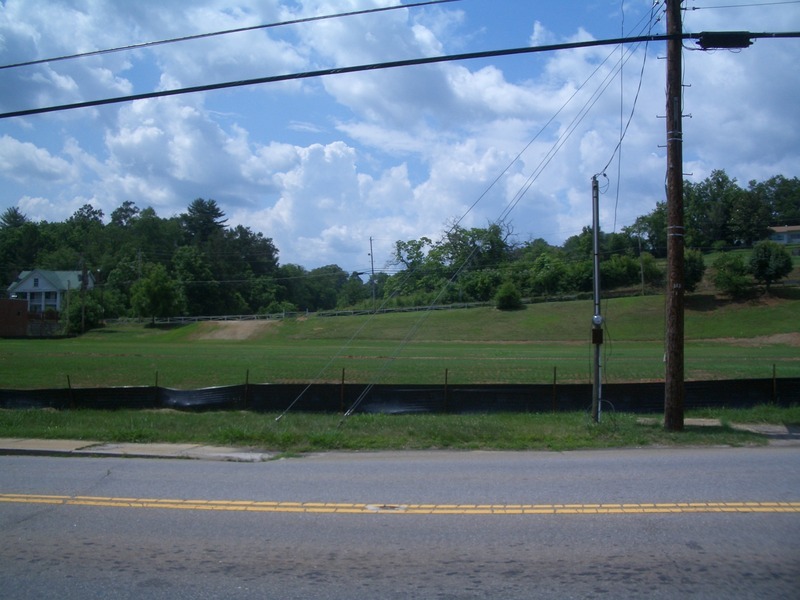 You can just see the lake over the railroad tracks. Then I crossed I 24 and took another road that ran parallel to it. It was another nice ride. 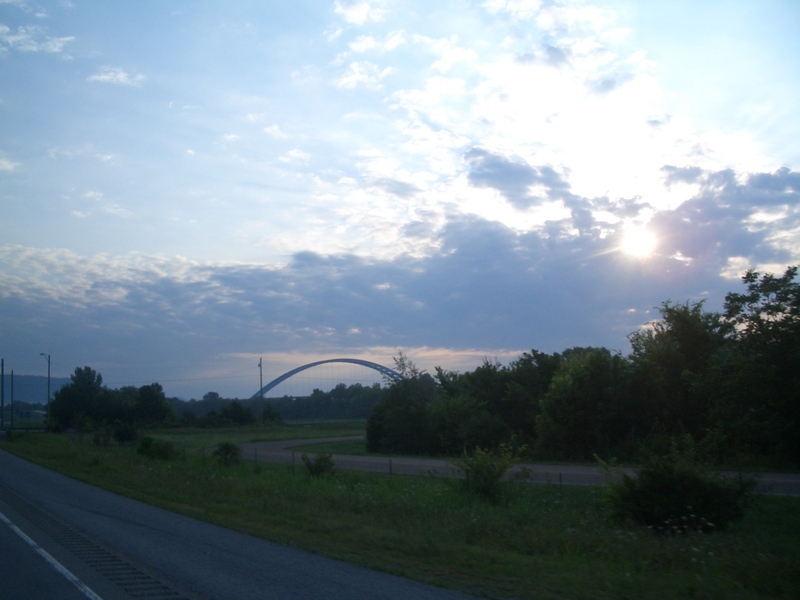 Eventually I got on the interstate and took I24 to I75 through Chattanooga. 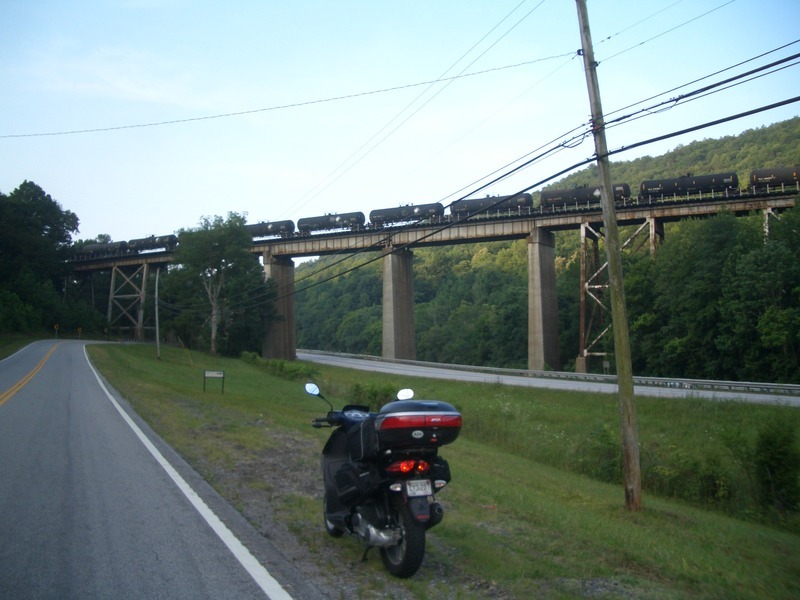 I got off before Cleveland,TN and worked my way to 64 east to the Ocoee river. In case you are wondering, my bike is a 2009 Aprilia Sport City 250. I got it a little over a year ago and put just under 9,000 miles on it before starting this trip. My camping gear is in the bag on the seat. The rest of my gear is in the saddle bags and some under the seat. I prefer to keep the tail trunk mostly empty and use it to store my helmet and jacket when I stop. That's pretty cool that you made the trip with the 250. I love trips on small bikes. So many now days seem to think you must have 1000+ ccs to go anywhere. I have ridden over 25,000 miles on my 350 with only a couple of minor problems, both of which got fixed on the road and the ride continued. Good for you for keeping it simple and just going. I have four bikes but my 250 is the best long distance touring bike I have. I have really enjoyed reading ride reports of trips on small bike. One of my recent favorites is from a couple who went around the world on a couple of 105cc Sym Symbas. By comparison I was on a luxury touring bike. I also remember when I considered a Honda 350 to be a fairly large bike......yes that was a few years ago and shows my age. I barely removed my helmet when someone came up and said "you're klaviator and are on a trip" It was an inmate who had read my post asking for route suggestions. I have a bad case of CRS so I don't remember his name but hopefully it will come to me. Anyway, it goes to show that if you spend enough time on this forum, anyone can become famous . 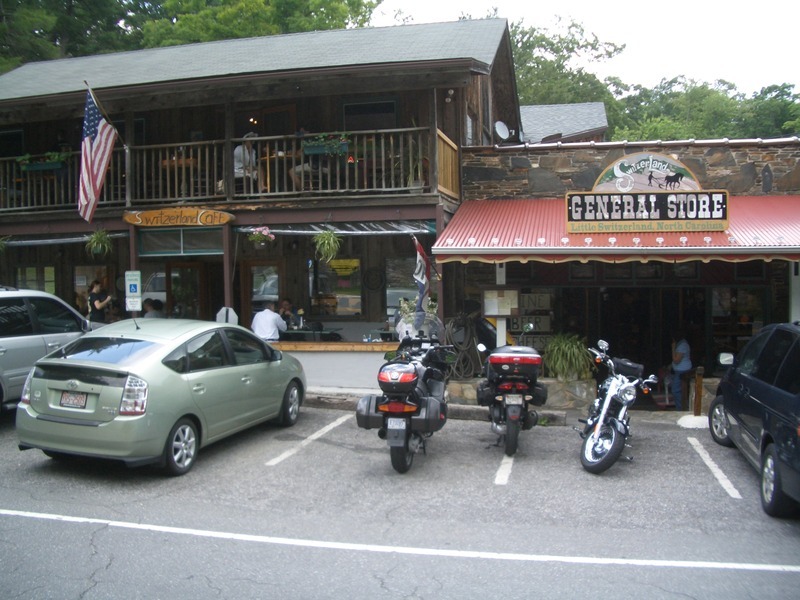 We had both bought bikes from Rider's Hill in Dahlonega, Ga. I bought my Sport City there and he had gone there looking for a sport city but ended up on a Scarabeo 500. Shortly afterwards he decided to go bigger and got a Mana 850 which he was riding to day. The owner of TMO, Minimike is a member of this forum and does a lot to support off road riding in this area. I like to support his business but there was nothing I needed from him today so I did the next best thing by going across the street and having lunch at the creamery which is owned by his wife. After the Skyway I took 143 to Robbinsville then 129 to 19 to Wayah Rd where I stopped for a break at the Natonal Forest parking lot for rafters at the intersection of 19 and Wahay rd. Then it was down Wayah Rd which was a blast as always despite some gravel in some of the corners. 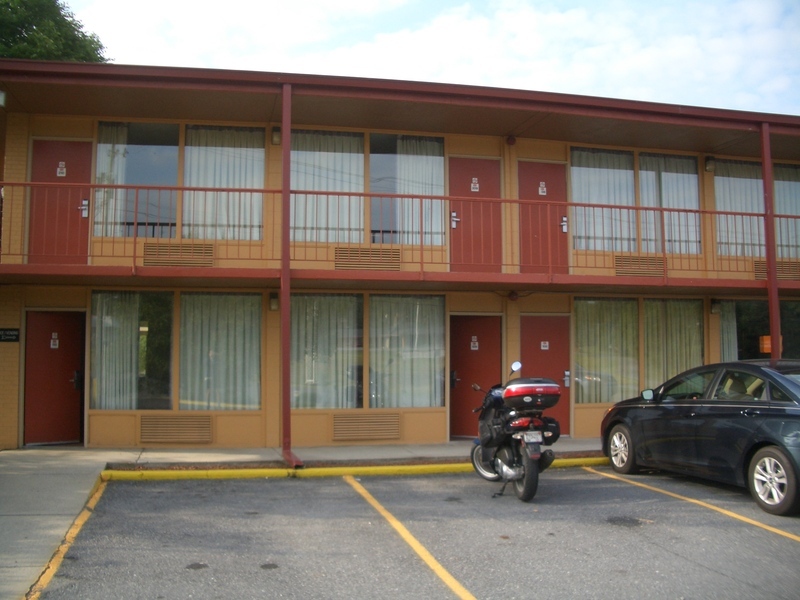 This used to be the Franklin Motel. Now it's just a grass lot. It was popular with bikers but I reserved a room there last year but ended up staying elsewhere becuase the room was unnaceptable. then I decided to take the shortest way to Blue ridge Cycle camp. There are some fantastic twisties in this area but I was getting tired so I just took the quickest route.....I guess I'm getting old. I pulled in to Blue ridge Cycle camp around 5 PM having ridden 356 miles. Good choice on 156. Looking forward to the rest of the trip. It was a good choice. I'll be using that route from now on. 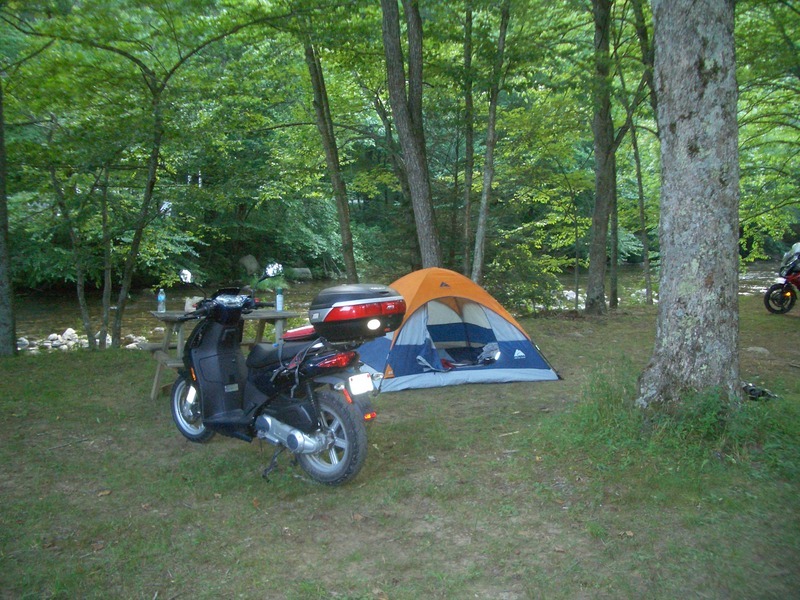 I have camped at a few other motorcycle campgrounds but this was my first time camping a Blue Ridge Cycle Camp. I checked in and wasted no time setting up my tent. It's an el cheapo $25 Wally World special but I didn't want to spend a lot of money until I knew for sure that this motorcycle camping was for me. It's 7 x 7 and packs up pretty small. My neighbors were a father and son who rode in from Bowling Green, Ky and Niceville, Fl. It was their first time here also. I enjoyed talking to them. the campground is very scenic and has small cabins for rent also. 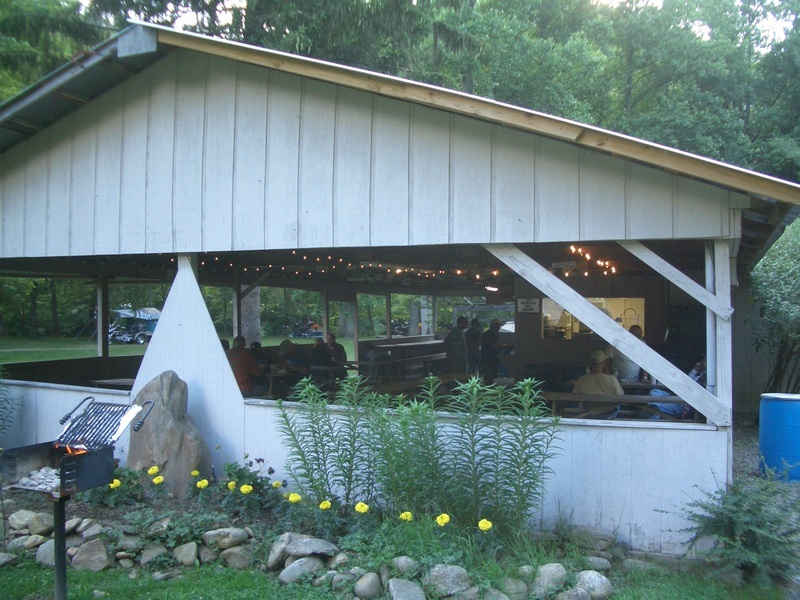 They serve breakfast and dinner at this pavillion and it provides a nice place to hang out if it's raining. 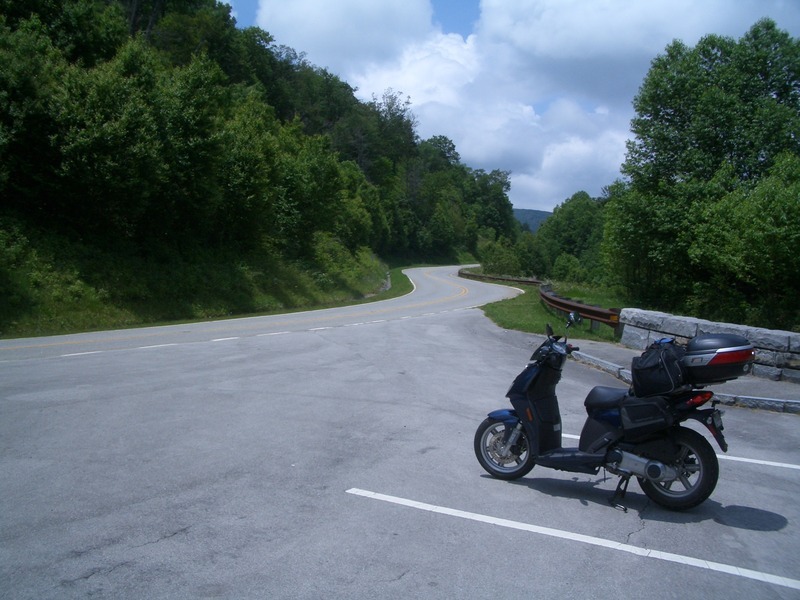 Starting to plan a trip on my SYM RV 250 to Florida, it would be about 1200 mile road trip. 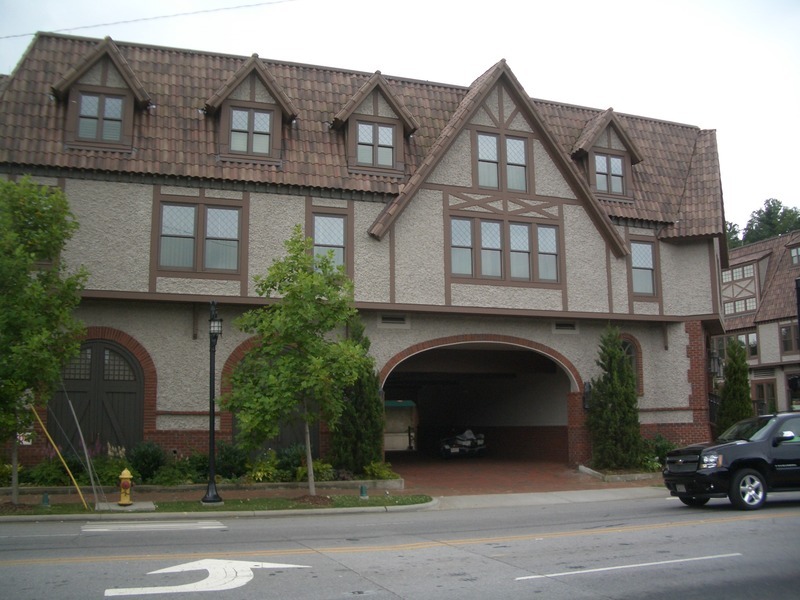 I would start out in St Paul,Mn and head down to our condo in Seacrest Beach, FL. I have been encourage by ADV riders taking their smaller cc bikes on these rides. Waiting for the "rest of the story". Looks like our frugal taste in tents is also similar. My wally world tent is around 10 years old and I also just kinda picked it up till I got a better one. We have a larger dome coleman for when we both go and I also have a tiny pup style tent. Hats off to you for doing it on a small bike too ! Go for it. Your 250 will handle the trip just fine. I have a slightly larger ( 9 x 7 ) Coleman tent that is also around 10 years old but when packed up it's about twice the size of my Wally World special so I only use it when I use the cage to get to the campsite. The "rest of the story" is coming but I'm a slow writer so it may take a while. When reading your ride report I was struck by how many nearly identical pictures we took. 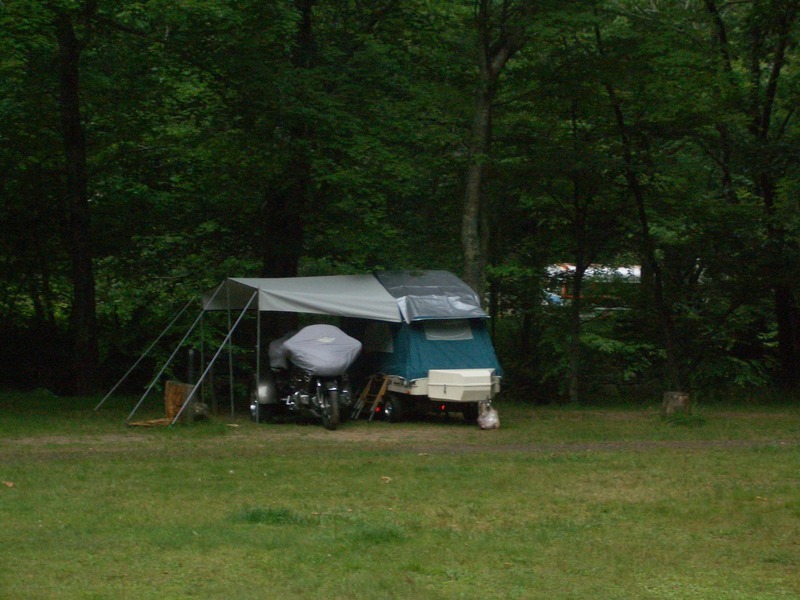 I have stayed at a number of motorcycle campgrounds. By far my favorite was TWO ( Two Wheels Only ). Unfortunately it is no longer open. Of the remaining Campgrounds I have camped at, this may just be my new favorite. It is very scenic, peaceful, and most importantly, surrounded by great riding. 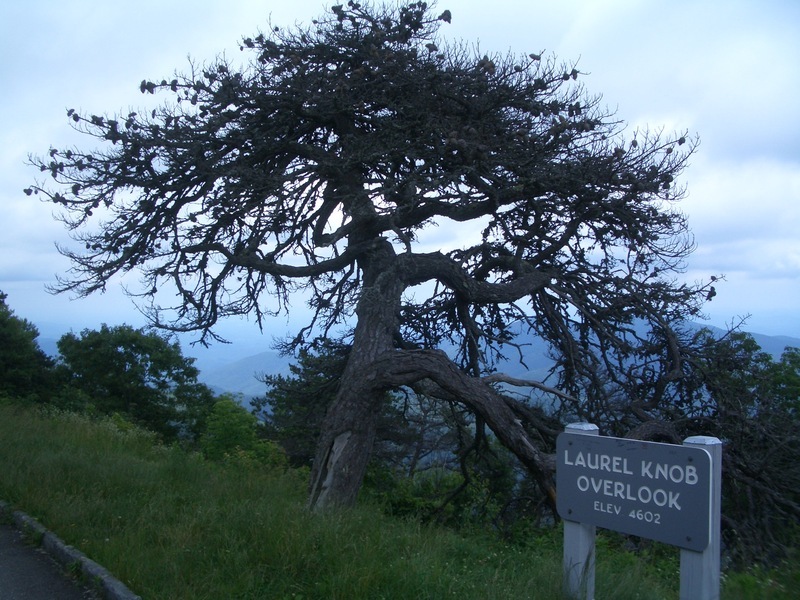 It is also at an elevation of 3200 feet. This can be good or bad depending on the time of year. In the heat of summer it's good and I doubt it ever gets too hot to camp here but cold may be an issue in the spring or fall. Back to my experience here. After talking a bit with my "neighbors" I wandered around. I ran into an old regular from Two Wheels Only and even remembered his name......quite an accomplishment for me . Then I saw trash can, another inmate. He was here with a large group who come here fairly regularly. We had exchange PM's so i knew he would be here. If you read this Jerry, , it was good talking to you. but the sacrifice to the ride is not something I would be willing to make. Breakfast was good. I don't remember if I packed up my gear before or after breakfast but as soon as I did it started to rain. I didn't remember seeing this in the forecast. After about an hour it stopped and I hit the road. Here's a handy alternative to setting up a tent if the weather is good. Takes up no more room as it can be used as a ground cover when you do want to take the time to set up a tent. Simply a tarp and some bungees and stakes. Nice when you want to get up and moving quickly in the morning. Blue Ridge Cycle Camp sit just off of route 276. 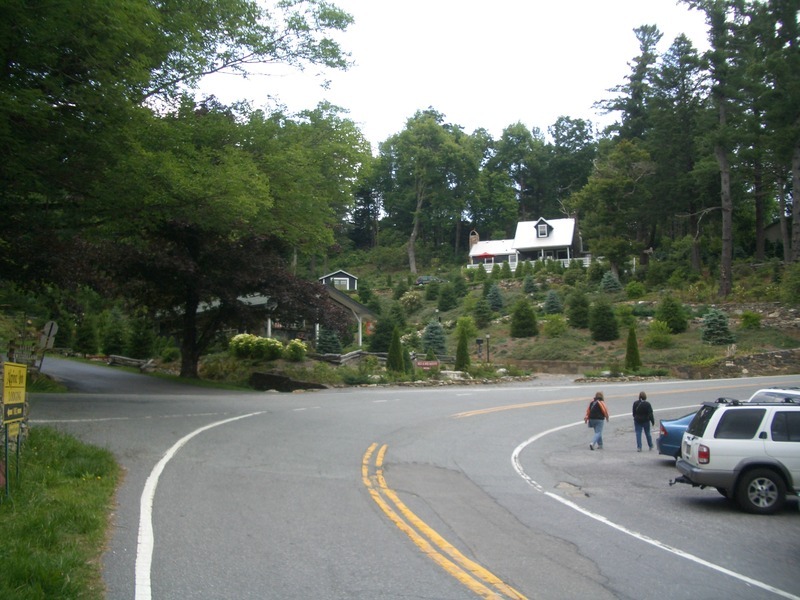 276 is one of those great roads that cross the BRP. 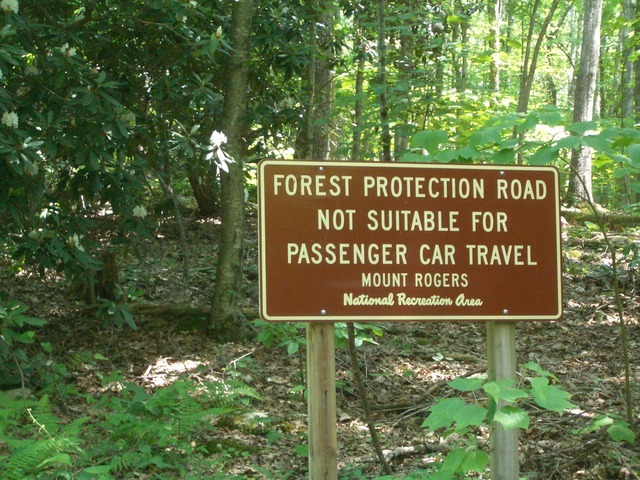 IMO, those roads are often better than the BRP itself. 276 is one of those roads but I restrained myself this morning since it was wet from the rain. 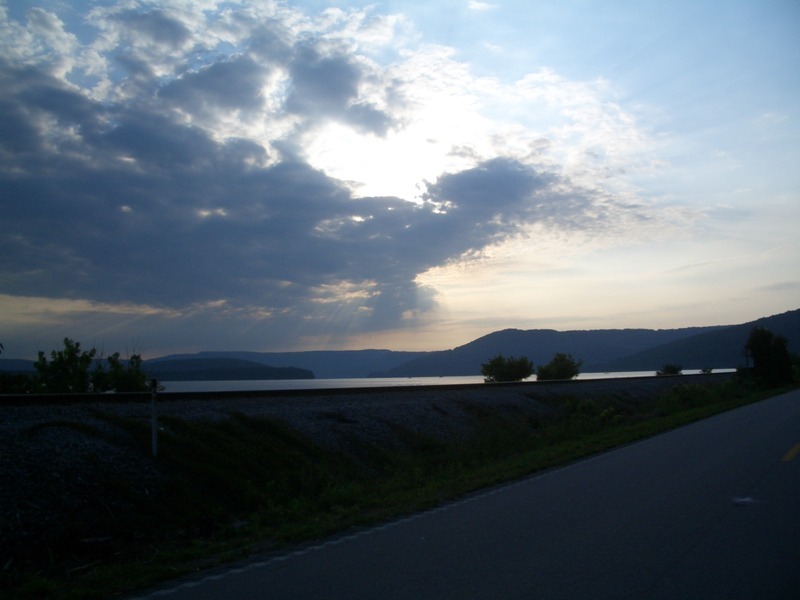 Then I got on the BRP and headed North. It was cold and gloomy so I was wearing my rain suit to stay warm and dry. I was really second guessing myself on my decision to wear my mesh riding gear. I also decided that not bring much in the way of warm clothes was dumb as I could have used a sweat shirt last night. I decided to stop in Asheville and find a Wally World and try to pick up a cheap sweatshirt and something to wear under my mesh pants. The BRP was a pleasant ride with the weather alternating between sunny and cloudy with occasional light rain. 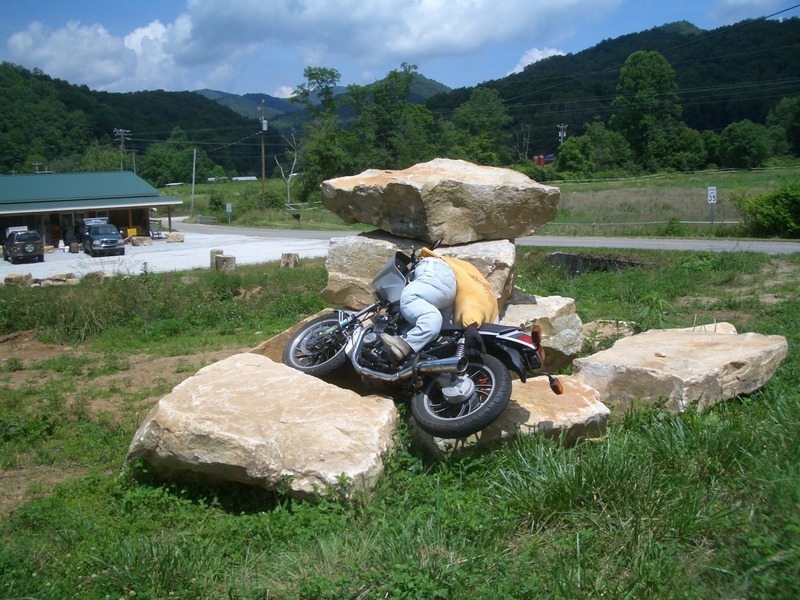 I exited the BRP near Asheville and stopped for gas. Although my Aprilia normally gets around 75 MPG, it only has a 2.4 gallon tank so I have to get gas more often than I would like. Additionally, the gas tank filler is under the seat so I have to remove the bag on the seat to get to it. What a PITA. After filling up with a whopping 2 gallons or less, I got directions to the nearest Wally World which was only a few miles away. Is it possible to be more than 10 miles from a Wally World in in city in the USA??? Then it was back to the BRP. Looking back on the trip, it may have been the most fun stretch of road on the trip. I stopped for lunch in little Switzerland. I have always thought this was a cool place. I had a chef's salad for lunch. It was good but I had to wait forever to get it. I have a pretty long bucket list and many of the things on my list involve riding. I planned on checking of a few of those things on this trip. 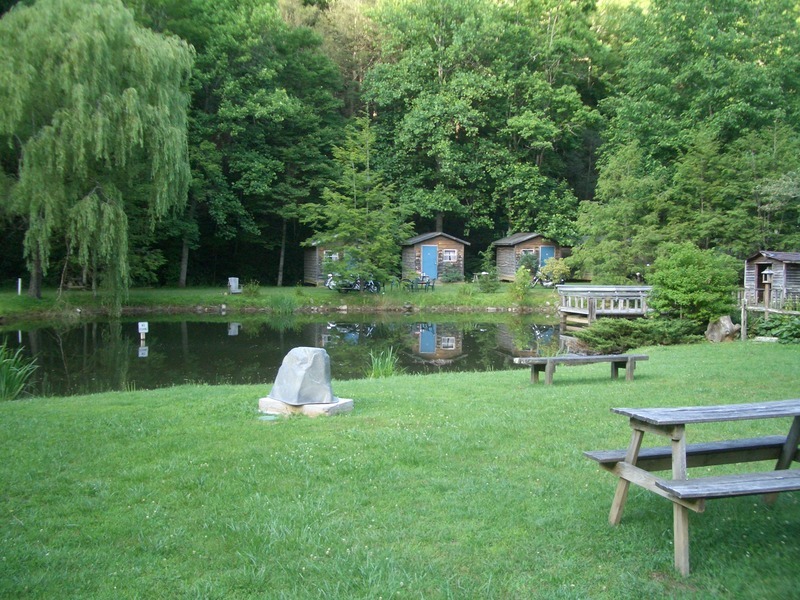 Camping at Blue Ridge Cycle Camp was on my list. Camping at Willville Cycle camp was also on my list and was my planned destination for today. I planned on going there but hadn't actually looked at a map to see how far it was. At lunch I took a look. It would be a pretty long ride and I didn't leave little Switzerland until late afternoon. I considered changing my plan but decided to ride for a while before making a decision. So I rode the BRP. Progress was painfully slow due to the cage traffic. it was also still chilly with intermitant rain. I was still regretting my decision to wear my mesh jacket. To make matters worse, my rear Dunlop was rapidly disappearing and tomorrow was Monday which meant it might be difficult to find a tire since most dealers are closed on mondays. So I changed my plans and decided to get off the BRP and head towards Marion, VA. 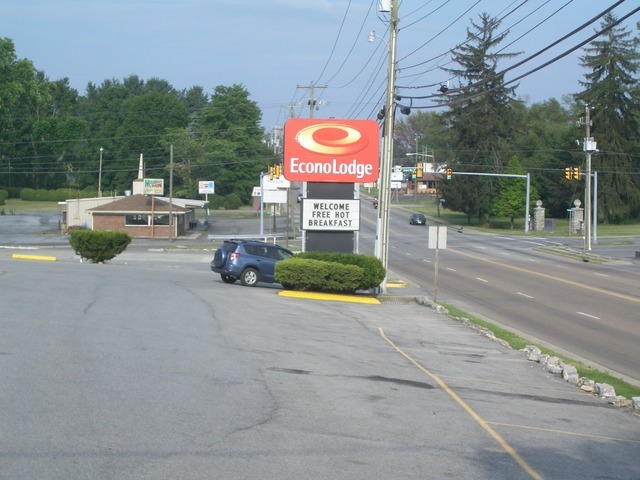 In Marion I decided on the Econo Lodge. I could probably ride it another day without it being completely bald but that would be the limit. For peace of mind I decided to try to get another one Monday if possible. BTW, that's a Dunlop 403 with a whopping 2600 miles on it. Total mileage was only 267 but it seemed like a lot more. I made a number of stops. 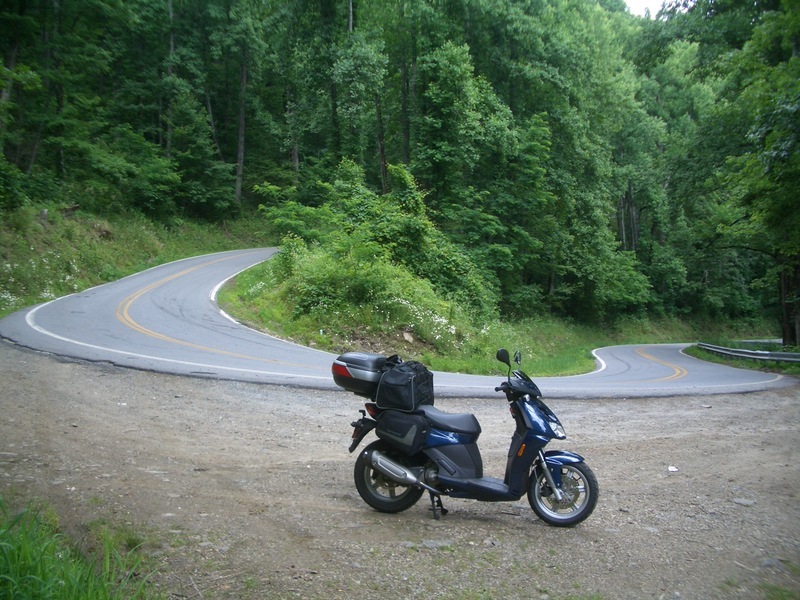 I spent a lot of time going slow on the BRP and when I was off the BRP, the roads where mostly very twisty. Dinner was a Mexican restaurant within walking distance. The Hotel was nothing special but it felt good to sleep in a real bed. Good to see you again, Wyn. Looks convenient but what about bugs? With the current heat wave, your favorite place would be a good place to be. I'll catch you next time I'm up in your neck of the woods. Just beginning to read your report but it sounds like a great one. I cross the river using this bridge quite often. 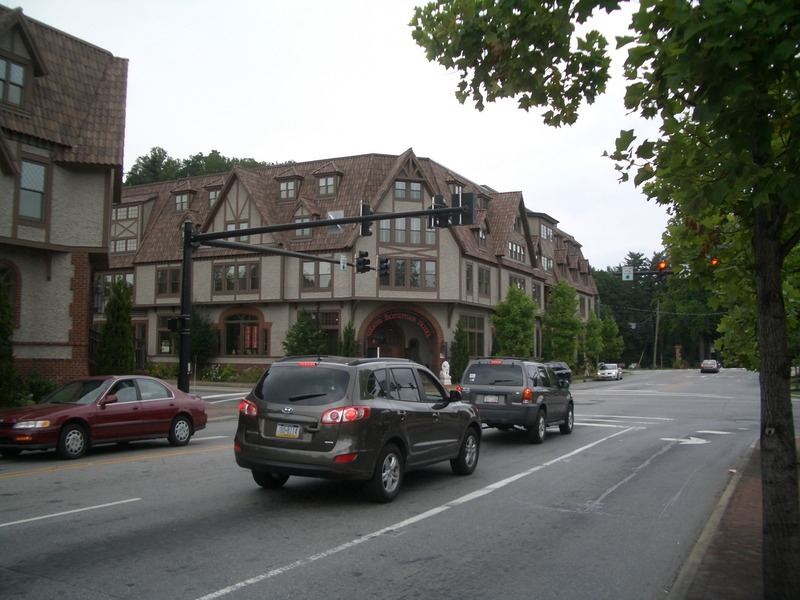 Although it wasn't going in the right direction for your trip, the best part of my travels through there is to stay on the west side of I-24 and take TN156 up to Sewanee, TN (University of the South). A nice, hilly and twisty ride plus the school campus is beautiful. I love my Aprilia. It's a blast to ride. It's Comfortable and has been trouble free except a leaking fork seal that was replaced under warrantee. My biggest issue has been that this thing eats rear tires very quickly. I replaced the stock tire at only 3200 miles. Since the stock tire is an unusual 130/80-15, I decided to try a 130/90-15 which is a common size cruiser tire. On recommendation of someone on the Aprilia forum I tried a Kenda. It worked great but only lasted 3700 miles. So I went with a more expensive name brand next. 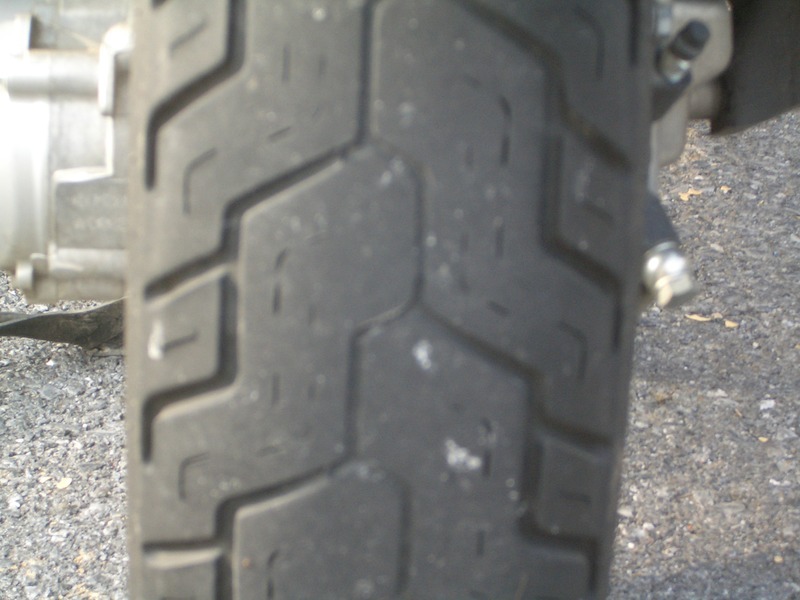 The results were the Dunlop which lasted all of 2600 miles. Unlike many people today, I have a cell phone which is just a phone, not a smart phone. A smart phone would have come in handy looking for a tire but I had the next best thing, a smart friend with a dumb phone and a computer. So I called my buddy Steve and he got on the internet and looked up some motorcycle shops in cities nearby. Surprisingly, most of these places were open Mondays and opened at 8:30 or 9:00 AM. 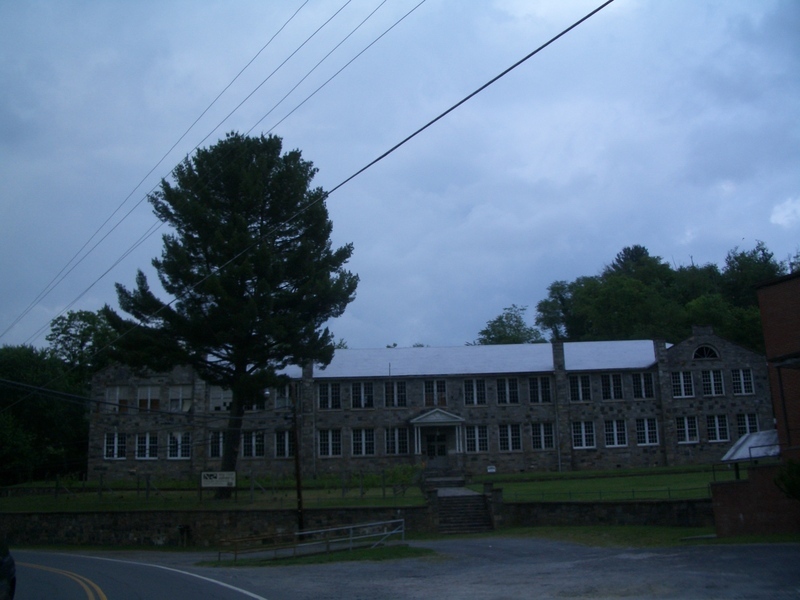 I decided that nearby Wytheville would be the most convenient so I tried there. The first place I got through to was a Honda/Kaw/Suz/Yamaha dealer. They had a tire in my size but would only work on brands they sold. I guess business was so good they could just turn it away.......or maybe their mechanics were to incompetent to figure out how to change a tire on something as exotic as an Aprilia? 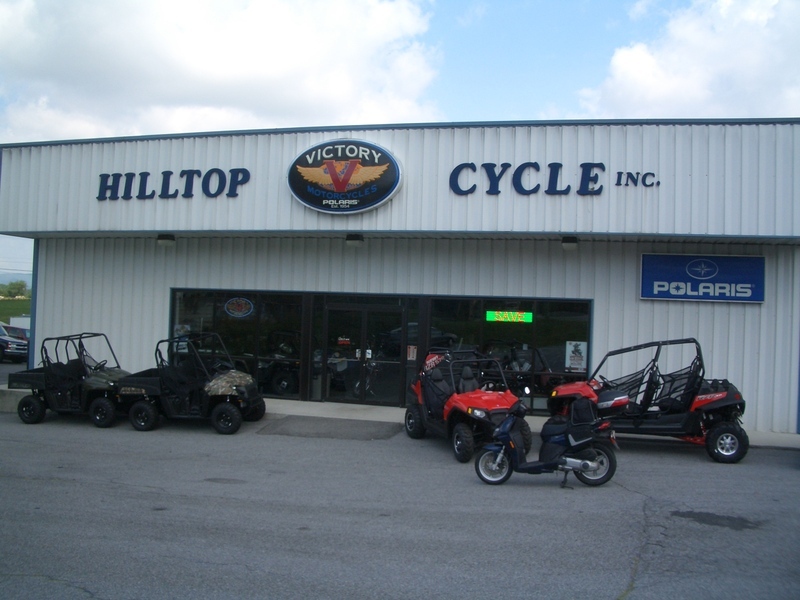 Based on my experience and also the way they took care of another customer who had a problem, I would highly recommend Hilltop Cycles to anyone passing through with a problem. Then I headed over to Wendys to get some lunch and come up with a plan for the day.